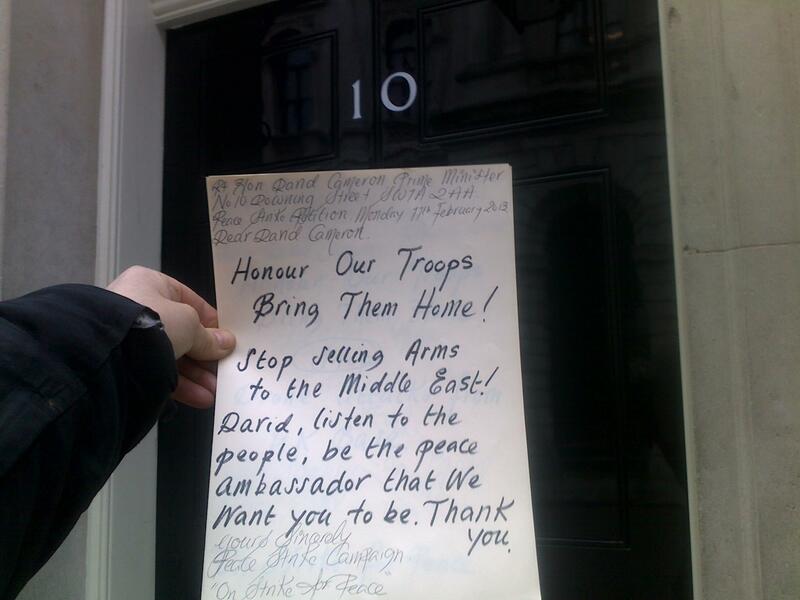 Downing Street Demo / Petition – Welfare not Warfare! March 5, 2013, filed under Bring Our Troops Home, PETITION; No Comments. 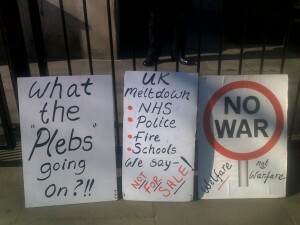 WHAT THE “PLEBS” GOING ON? UK meltdown underway right NOW! Public assets are being sold off against public interest. New legislation opens way for privatization of our National Health Service. The NHS, is due to celebrate its 65 year anniversary this year. In post war Britain they managed ,with great determination, to bring into existence the world renown National Health Service. This was made possible because the political will was there to support the notion of a health service for all. Our health service was respected throughout the world. Today, we are a country at war in present time and we now find ourselves in the position of our own government making it possible to sell- off our national treasure. THE NATIONAL HEALTH SERVICE SHOULD NOT BE SOLD OFF, IT BELONGS TO THE PEOPLE! Billions of pounds has been spent in recent years refurbishing hospitals, making them a viable proposition for privatization. Mismanagement has left the NHS vulnerable and much criticized. Lack of beds and poor clinical care opens the door to the alternative of an attractive ‘take over’ by companies that have money to inject into the failing service. However, what we must remember is that private companies will wish to make profits…BIG PROFITS! WAR IN AFGHANISTAN IS COSTING 12 MILLION A DAY! We can save our health service if we end the war now and bring the troops home. Medical personnel could be deployed in our hospitals for a given period of time, just like the help they gave us during the Olympics. This is do-able and make sense. Saving life is far better than being involved in endless futile conflict. War in Afghanistan costing £12 million per day…. Austerity cuts are destroying our country! Bring the troops home NOW! 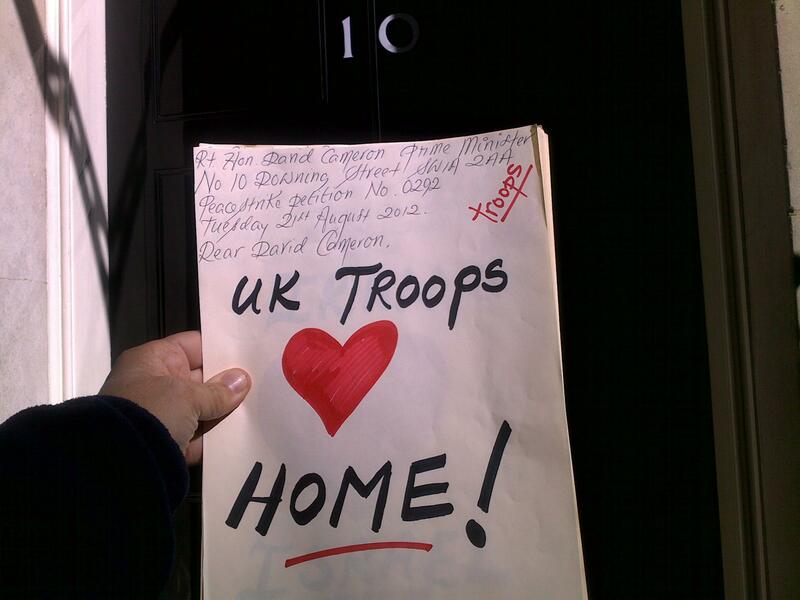 February 14, 2013, filed under Bring Our Troops Home, PETITION; 5 Comments. Put the picture together. They are running down our services to make way for privatization. All the people’s hard earned assets are being sold off under the guise of having to make cuts as there is no money available. However, there are companies circling over head, such as Virgin Care, waiting to step in and invest in order to make huge profits. The same applies to the Police Service, Fire Service Schools etc……. NHS cuts and threat of privatization. Schools under threat of privatization. Billions to be spent on new roads that developers want, despite evidence to the contrary. November 11, 2012, filed under Bring Our Troops Home, PETITION, REMEMBRANCE; 6 Comments. 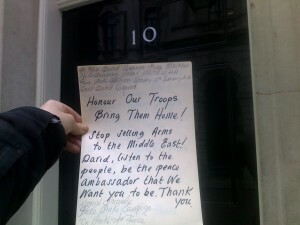 Peace Strike’s on-going petition to end this futile corporate war and bring our soldiers home. Composer Lee Hayes – Pete Seeger. Payday mens network supporting service personnel and veterans.